Though Indian handicrafts is around 5000 years old, references of wood carving are found from the vedic age, some 1500 BC. A sculpture, figure or figurine may be formed out of working wood by means of a cutting or carving tool. Some of the basic tools are carving knife, a gouge, the chisel, a mallet, v ad u shape tools and of course the grained or sand paper. 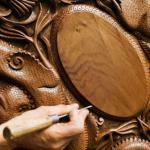 The scope of carving depends on the nature of the wood. Commonly used wood for carving includes chestnut, walnut, mahogany and teak. Hardwoods have a longer life and lust. Softer wood is easier to carve. Natural oils of walnut and linseed are used to polish the complete pieces to protect them from lust and moisture. The technique of lamination of wood objects is unique to Kerala. The products made are dishes, nut-bowls, and table-mats. These are made by joining together pieces of different woods.